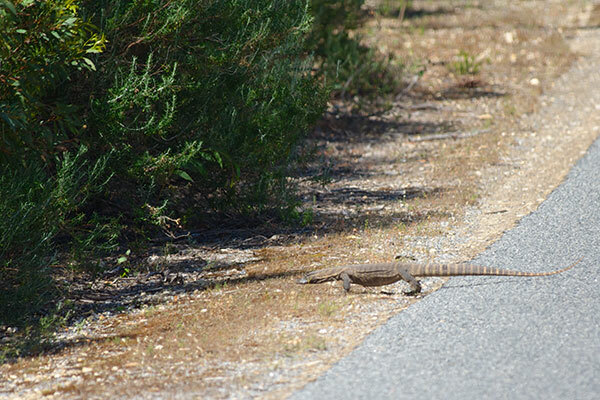 Heath Monitors are distributed only along a fairly narrow band of Australia's southern coast. I had specifically hoped to see them on the first part of my trip near Sydney, but had struck out there. So when I once again reached Heath Monitor territory at the end of my month-long trip, I was on the lookout. That turns out to have been unnecessary, since I quickly found this mid-sized monitor strolling across the road. I got a couple of long-distance photos with a 300mm lens through my opened car window, then pulled the car over and got out to relocate it on foot. 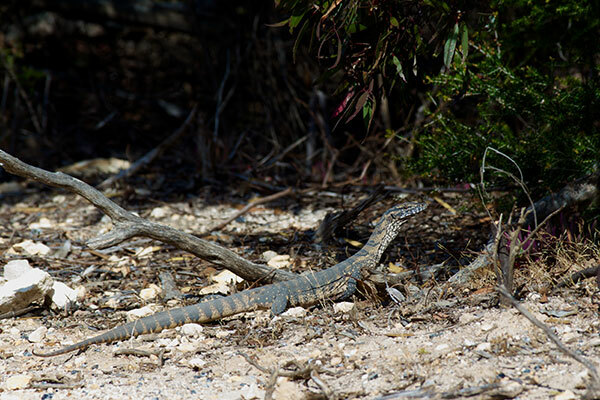 It wasn't as wary as most lizards would be, but it moved continually through fairly thick vegetation, only pausing occasionally and then only for a moment or two. 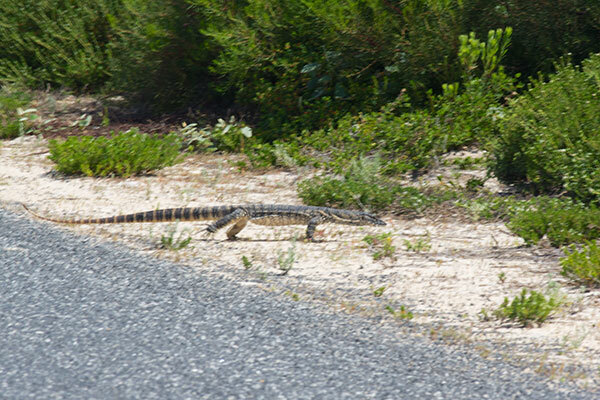 Ten minutes or so later I saw my second Heath Monitor leaving the same road. This one eluded me completely in the bushes when I tried to follow it on foot. The next day I walked up on this one that was lounging on the side of the trail. I had to move really slowly to get this photo, after which it hurried off into the distance. 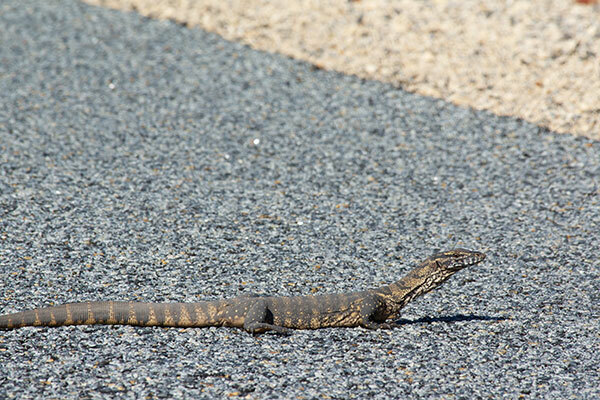 Three more Heath Monitors presented themselves to me on the roads at Lincoln National Park that day. Two of them I saw only from a long distance. This third one was more cooperative. I snuck up on it bit by bit, taking photos as I approached. 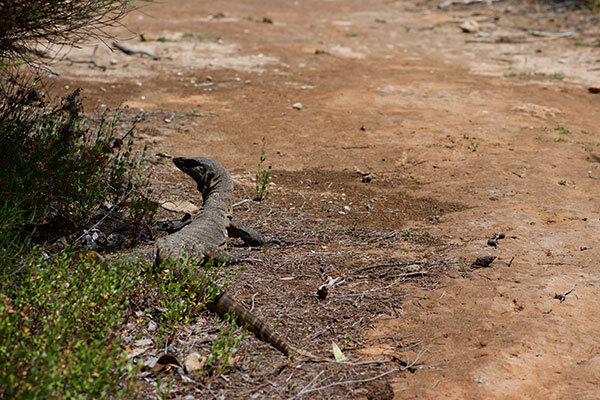 The top picture is as close as I got before it decided I was a little too close and wandered off the road. 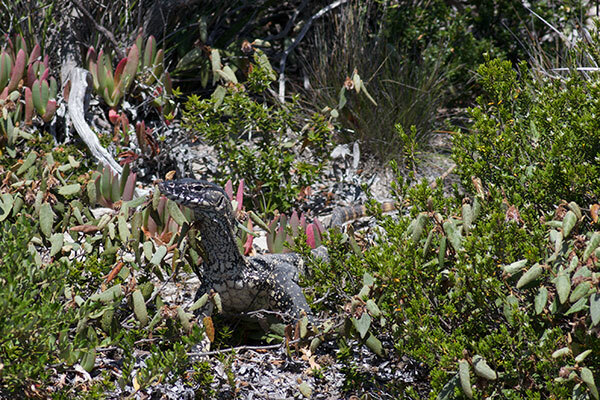 But then it paused again just as it reached the edge of the vegetation, and I got some more photos there.